Need more information about booking Home 6635784 ? 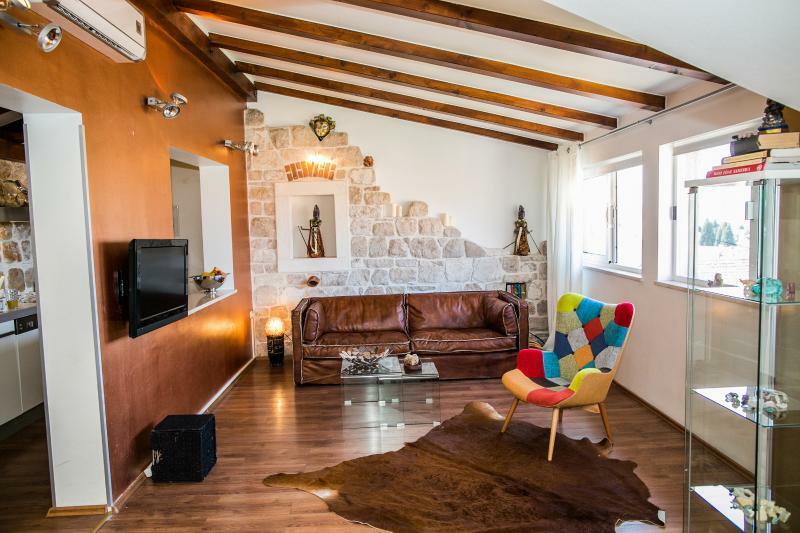 Catherine's Garden is a uniquely decorated 80 square meter apartment located just outside the the old city center in Sibenik. It offers everything you need for a short break or longer stay. We offer free WiFi, free parking, cable TV with pay per view, a fully equipped kitchen with coffee making facilities, laundry, drying and ironing facilities. Our apartment features a terrace with a sea-view, historical site view,outdoor dining area, barbecue facilities and own private garden designed for a personal retreat among specific dalmatian flora. The apartment is a 10 min walk from St. James Cathedral ( UNESCO World Heritage Site), St. Michael.s Fortress and other sites of interest. The apartment is close to the town waterfront that has ample cafes, restaurants. BANJ beach is 15 minutes away that offers a recreation area, day beach facilities and a night club for those who are willing to party further into the night. Interestingly Sibenik is a filming location for the international blockbuster series "Game of Thrones" in which it portrays the island kingdom of Bravos. KRKA and KORNATI national parks are just a short drive away with regular ferry lines that will take you to beautiful beaches of nearby islands. KRKA national park can also be accessed by car. Catherine;s Garden is 2 minutes away from the city pedestrian zone which offers open street music events, festivals for general enjoyment. Guests are requested to keep apartment clean and tidy. You can get in touch with Kristian (the owner) through the contact form on this page. Send Kristian (the owner) an email through the contact form on this page. Alternatively, if there’s a phone number on this page, you can call them. How do I contact Kristian (the owner)? If you’ve already booked, go to Manage your holiday booking to view Kristian the owner's contact details or send them a message. Or send Kristian (the owner) an enquiry through the Contact the owner/manager form if you’d like a quote or more info first. When you pay online through the Book your stay form, a booking request is sent to Kristian (the owner). You’ll find out within 24 hours whether they’ve accepted - no money will leave your account before then. You can also request a quote from Kristian (the owner) through the contact form. The owner will email you the total cost for your dates and a link to book and pay online. Use the Book your stay form to pay provisionally online. You can pay by credit/debit card or PayPal. Kristian (the owner) will have 24 hours to accept the booking and no money will leave your account before then. Why can't I call Kristian (the owner) before booking? You’ll need to contact Kristian (the owner) to do this. Send them a message in Manage your holiday booking or through the contact form on this page. You can request to change the dates or number of people on your booking via the Manage your holiday booking page. To change your holiday dates use the Edit booking button. If you need to change the number of guests staying then send Kristian (the owner) a message. If Kristian (the owner) agrees, they’ll send you a revised quote outlining the changes. You can review and accept/decline this from the Manage your holiday booking page. You’ll have 48 hours to take action before the revised quote expires.